Beautiful beaches, fantastic scenery and sunshine galore but how accessible is the Riu Touareg Hotel in Cape Verde? Cape Verde is a beautiful set of islands to the West of Africa. As an independent, Portuguese speaking country, Boa Vista is the largest of the islands and is home to the Riu Touareg Hotel. The hotel itself has 1151 rooms, an adult only section (which admittedly I did not enter) and a large selection of staff, able to assist or entertain you. The Riu Touareg hotel is a large, flat hotel with ramps to every raised level. With rooms available on the ground floor and numerous bars within short distances, the hotel seems to cater well to those with disabilities. The hotel’s flooring is a mixture of smooth, layered brick flooring and shiny, flat flooring which is fantastic for wheelchair users to zoom around the hotel’s vast complex. On the other hand, the shiny surfaces can make it extremely slippery for those with other mobility issues but the staff are always keen to place ‘wet floor’ signs in clear view. If the sun is shining, which is extremely likely, the floor dries quickly and you should be okay to explore what the hotel has to offer. For guests with a visual impairment, the complex could be difficult to navigate however with large, open pathways and staff on-hand, you’ll never be lost at the Riu Touareg Hotel. The staff are extremely friendly are on-hand to offer any additional assistance and the grounds are very well kept, with workers often sweeping the floors and ensuring a happy time for the guests. It is highly likely that you have either booked or are looking to book with TUI. My experience with the group has shown that they are not always as accommodating as they like to come across, especially when booking transfers from and to the airport. The transfers to Riu Touareg are operated by TUI and are standard coaches without wheelchair access. If you have any additional needs, it is worth speaking with TUI and potentially asking them to organise a private transfer car for your stay. The ride to the hotel is also extremely bumpy so if you would struggle with a bumpy 30-40 minute car journey, I might suggest trying the other RIU hotel on the island. The hotel caters for a wide range of culinary tastes and preferences, through its multiple, themed restaurants. During the day, there is a main restaurant and snack bar whilst at night they have an Italian, Cape Verde, Asian & Grill restaurant on offer – all of which are step free to access. With a buffet-style serving system in every restaurant, the food is about as accessible as you would expect at a standard buffet restaurant. The food is at quite a high level (eye level) if you’re a wheelchair user however there is enough space to navigate both a wheelchair and a helping hand to assist. The seats and tables in the restaurant are at a good height however the space between tables can be tight if you have mobility issues. Having said that, there are a multitude of seats available and the lovely waiting staff would be able to reserve you a table if necessary. All of the bars, except one are step free however with 5 bars within the complex, you’re never short for a drink. The staff are fantastic at keeping tabs on your drinks and although the bars are a above eye level, they are very observant and would notice your presence at the bar. Drinks are served relatively quickly so you don’t have long to be on your feet if standing up for long periods is a difficulty. There are two main pools at the resort, where one of them is separated into sections by bridges, to allow you access to the other side of the pool however none of the pools have a hoist. There is a ramp into the pool for those that struggle with steps and every set of steps has a one-sided grab rail for ease. They do have sun loungers that are dedicated to those with disabilities however able-bodied individuals were using them every day. Having said that, I’m sure if you were to ask, management would be more than happy to assist you with reserving an accessible sunbed. Even with two different pools and multiple accessible sunbeds, it is quite a walk to an accessible toilet however standard bathrooms are available after a short walk. The hotel has two accessible toilets in the whole resort, one in the snack bar and one near reception, which both have one rail on the side of the toilet. There are open-topped bins available for any disposable products however the accessibility-ness of the toilets is not quite up to the expected UK standard due to the lack of moving space and grab rails. A multitude of ground-floor rooms makes, on the face of it, a good start for an accessible room. Despite this, the rooms are the only accessibility-based downfall of the Riu Touareg Hotel. Their ‘accessible’ rooms have no accessible features whatsoever, apart from their ground-floored nature. Although there is enough room around the bed to navigate a wheelchair, the shower and toilet facilities are somewhat different. Their ‘roll-in shower’ has a 6” step, with a doorway not much wider than an individual with broad shoulders. However, despite the lack of grab rails in the shower, there is one just outside the cubicle, to help you navigate the step. The toilet shares a similar story of inaccessibility as the doorway is also very small and there are no grab rail facilities – certainly not up the standard you would expect for an accessible room. I had previously raised the issue with both TUI and the hotel upon my first visit in January 2017 however there have been no improvements to the in-room bathroom and shower facilities. The entertainment team are wonderful and there are plenty of activities on offer within the resort. There are lots of activities that are open to those with varying disabilities, such as bingo, shooting, yoga and their courts are accessible too! Although there is no step-free access to the front of the stage for the evening entertainment, there are plenty of seating options at the side of the stage. Accessibility for guests has clearly been thought through with the flat landscape and ramped access to the facilities however it is clear that they don’t quite meet the standard that I would expect, to label the Riu Touareg Hotel as fully accessible. 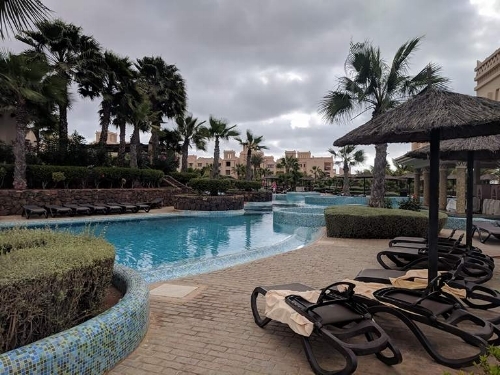 Having said that, if you’re looking for a great beach, great sun, lovely staff and plenty to eat, the Riu Touareg Hotel in Boa Vista should be great option. I have sent my recommendations to management and I hope that with the correct changes, the hotel can continue to offer a great service to its guest.